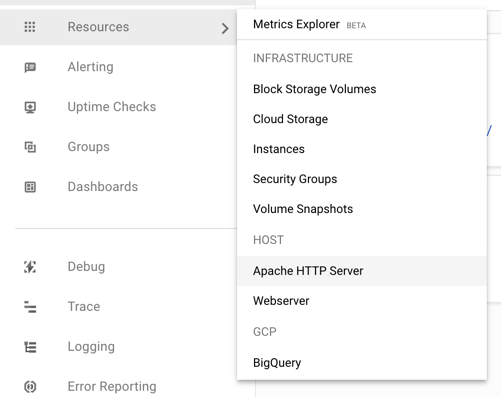 This guide walks you through implementing Stackdriver monitoring for an Apache 2 server. Google Stackdriver is a freemium service that monitors and logs performance metrics of your applications and infrastructure on Google Cloud Platform and Amazon Web Services. To use Stackdriver, the project must be in a Stackdriver account. You will be redirected to the Stackdriver application. Log into Stackdriver with your Google account. Select the Google Cloud Platform project you want monitored as part of this account. Skip the next two screens around adding additional projects and setting up AWS monitoring. Monitoring agents: collects system and application metrics from VM instances and sends them back to Stackdriver Monitoring. The agent can also be configured to monitor third-party applications, such as Apache. This requires Stackdriver Premium. Logging agents: allows you to read and write log entries from your cloud application. Download the mod_status configuration for Apache. Activate the configuration, and restart the Apache service. Download and activate Stackdriver’s Apache monitoring plugin. You may need to modify existing Apache rewrite rules if attempts to access “/server-status” results in rewrites. The below example assumes you are modifying rewrite rules for a WordPress site. In the left-hand menu select Resources. If everything has been set up correctly, under HOST you should see Apache HTTP Server and Webserver. SSH into your VM instance. If, instead, you see HTML returned, it is likely that your server is trying to resolve “/server-status” to your server’s scripts and is returning a custom 404 page. Follow the steps above to turn off URL re-writing and forwarding for “/server-status”.